We've got the creepies and the crawlies here at StuffedSafari.com and we couldn't be happier about it! Our stuffed reptiles and plush reptiles are just as precious to us as any of our cuddly and cute warm-blooded stuffed pals. These cold-blooded creatures are real heart warmers. 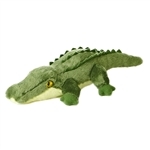 Our stuffed reptiles and plush reptiles pages include stuffed alligators, plush turtles, stuffed lizards, and an amazing variety of plush snakes. If you have an avid Animal Planet watcher in your family then these pages are surely loaded with stuffed reptiles and plush reptiles that will produce many huge smiles. Our 118 inch Giant Plush Anaconda by Fiesta is an awesome stuffed snake that is a must have for any aspiring herpetologist. Maybe a pocket-sized plush clip-on snake is more your speed, and if so, you've come to the right place. Wildlife Artists have an amazing line of plush clip-on snakes that we can hardly keep on our shelves. Just scroll through the pages below to check out our awesome selection of stuffed reptiles then click on a photo to get more information on that stuffed reptile or plush reptile. For help finding what you need you can simply give us a call at 866-534-6604 and our amazing sales staff can assist you in making your choice, or at least help you creep and crawl in the right direction!